As well as television repairs I also offer repairs to all types of Hi Fi equipment. As an apprentice I was given all the car radios, music centres and hi fi systems to work on, mainly because nobody else wanted to bother with them, but I enjoyed the work. I have always been a fan of good audio equipment and loved working on turntables or replacing the dial drives in the old receivers. Of course things got far more technical as I gained experience. Hi Fi itself has changed a lot over the years but quality equipment will always be quality equipment and will always be worth spending a bit of money on. Unlike a tv I think serious lovers of music form a connection with their Hi Fi and are less inclined to bin it as soon as it has a problem.Take turntables, which are making a massive comeback at the moment, an upmarket one is a major feat of engineering and will give a sound that has never been matched by CD. I’ve always loved the warm, rich sound that vinyl gives, in this digital age I like to say it has an infinite sampling rate, you get to hear all the recording, not just a sample of it, as would be the case with CD or, god forbid, Mp3. 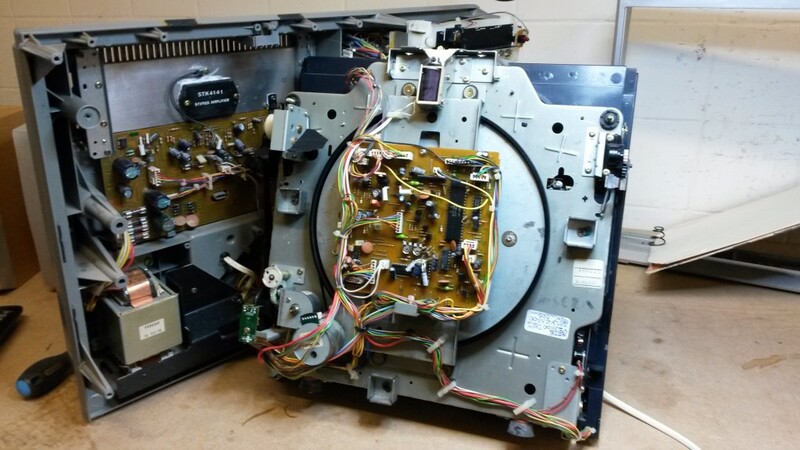 So I can offer a repair service to Turntables, Amplifiers, Receivers, CD Players, Tape Decks, Music Centres and Radios of any age, please get in touch by phone or email if you would like my help.